Herxheimer Reaction Detox Symptoms - How Do You Adjust Your Protocol? Are Herxheimer reaction symptoms a concern for you? Your organs of elimination - liver, gallbladder, kidneys and colon - all need some extra support during detoxification of mercury and other heavy metals, phthalates (toxins from plastics), environmental toxins such as dioxins, radioactive compounds and many others. PHOTO: Glytamins to the rescue! 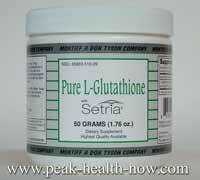 Liver, kidney and gallbladder support helps regulate eliminative function. If a protocol is working and you are feeling better, don't change a thing. It's working, why mess with it!? Herxheimer reaction can manifest in many ways, depending on type of toxin being cleansed and your individual situation. Also called 'herx,' 'detox symptoms' or 'cleansing symptoms,' they can range from mildly uncomfortable to almost unbearable (always have any suspicious symptoms checked out medically). Herxheimer Reaction: How Do You Adjust Your Protocol? Mercury detoxification, for example, is tricky in that we are asking an already challenged, stressed body with overburdened liver to eliminate a very toxic metal in the most efficient and safe manner possible. This is true for any toxic substance - chemicals, drugs and many others. Since herx effect is in its simplest form the inability of the body to eliminate toxins fast enough, it can be helpful to assist the elimination process. A coffee enema can do wonders. Colon cleansing in the form of a colonic can also be of great help. 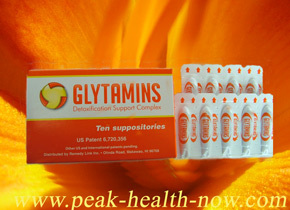 Glytamins Ingredients: Glycine 120 mg, Taurine 120 mg, phosphatidyl choline 120 mg, Bupleurum 120 mg, chanca piedra 120 mg, pepermint 20 mg, Magnesium Di-Potassium EDTA 20 mg, cocoa butter.